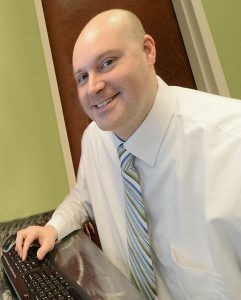 Allan D. Robison, president and CEO of EXEControl Global Solutions in Clifton Park. All business owners look for ways to increase their bottom lines by working smarter and Internet technology often helps them to do just that. But businesses can rely on technology too much, said Allan D. Robison, president and CEO of EXEControl Global Solutions headquartered in Clifton Park. Robison said there was a time in Hershey’s history when its ERP system told the company not to make more chocolate bars. 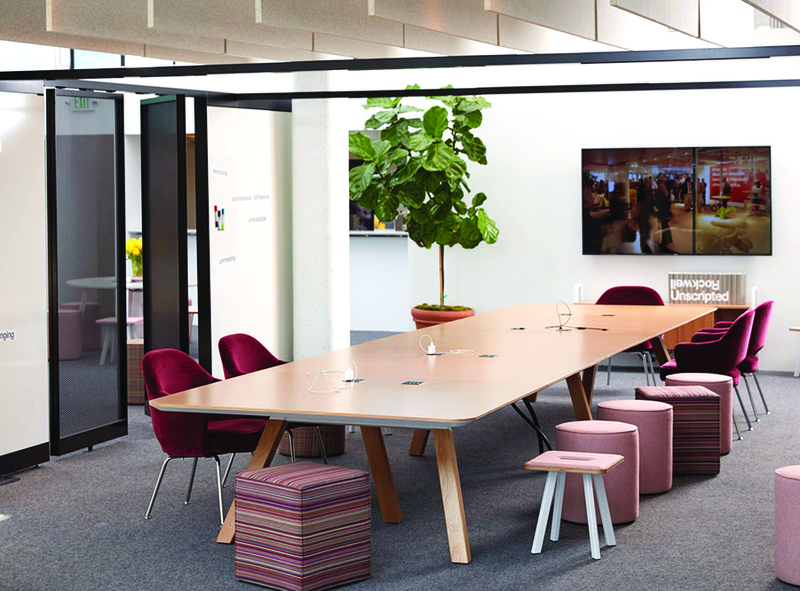 This is an open office space collaboration area featuring a Rockwell library table and seating by Knoll, available from drb Business Interiors. Today’s offices often combine open areas with private conference space, may be furnished more like a living room or cafe than a traditional office, and allow for people to work either sitting or standing up, according to two Saratoga office designers, Lisa Boyle of the Boyle Group and Dorothy Rogers-Bullis of drb Business Interiors. Boyle sees a trend toward “well-certified buildings,” similar to LEED-certified but focused on the health needs of the people inside the building. “It’s a huge trend,” she said. It may include ergonomically designed chairs, stand-up desks, task lighting that focuses on the work surface, locally controlled heating and cooling, and a lot of greenery. She noted that millenials, who now constitute a third of the workforce, are very concerned about their health and well-being. 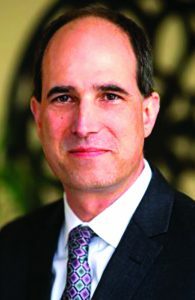 Mark Shaw started StoredTech in 2010. The company has an office in Saratoga Springs. IT provider StoredTech has again been recognized by Inc. magazine as one of the fast-growing companies in America. The company was added to Inc.’s top 5000 list for 2018, something StoredTech owner Mark Shaw said is due to their unwavering focus on customer service. Inc. is a monthly publication focused on growing companies. It named StoredTech 2,555 out of 5,000 in 2017. In 2016, the company was ranked 1,113 in the magazine’s ranking of 5,000. According to the magazine, StoredTech showed a 167 percent growth over the last three years. 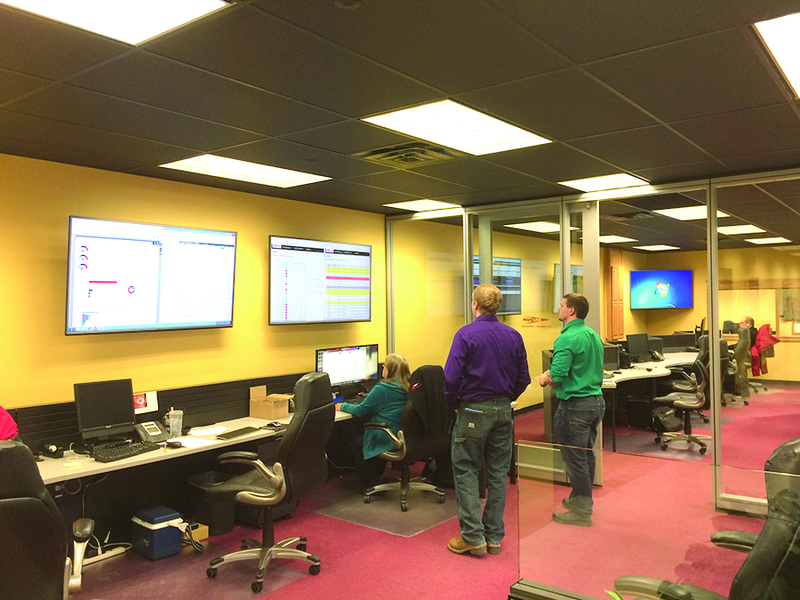 PrimeLink Inc, a regional telecommunications company with an office in Queensbury, overhauled its Plattsburgh office to accommodate a state-of-the-art Network Operations Center. PrimeLink Inc, a regional telecommunications company with offices in Champlain, Plattsburgh, and Queensbury, has continued to build its regional presence in the Champlain and Upper Hudson Valley areas by overhauling its original Plattsburgh office location to accommodate a state-of-the-art Network Operations Center. The new NOC is a place from which network administrators and engineers supervise, monitor and maintain the PrimeLink telecommunications network, company officials said. The NOC includes a main observation room which contains several visualizations of the network being monitored, workstations at which the detailed status of the network can be seen, and all necessary software to manage the network remotely. The company said the NOC is now the focal point for network troubleshooting, performance monitoring, and coordination with affiliated clients, vendors, and other networks. It represents the center of the PrimeLink regional infrastructure, monitoring the activity and performance of its overall fiber infrastructure that stretches from Montreal, Quebec, to Albany. Officials said from this central location, the information exchanged through the PrimeLink network is carefully monitored so that all phone calls, critical documents, presentations, business transactions, and so forth—arrive on time and intact as expected. Jenny Crawford, seated left, founder of J.C. Sweet & Co., poses with her staff. 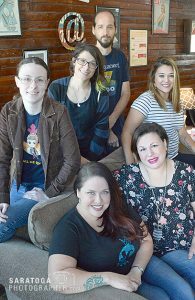 After eight years in an at-home office, J.C. Sweet & Co., a website design company, moved to larger quarters and increased its staff from two to eight. “We outgrew the home office. Things got too busy,” said Jenny Crawford, founder of the company. The company plans a formal ribbon-cutting on Oct. 18 at its new quarters at 1 Lake Hill Road in Ballston Lake. Five people work in the office and three more work off-site. The company builds websites and helps to manage them. It also helps business owners come up with effective strategies to use social media to promote their businesses and trains business owners and their employees. “We help people who are uncomfortable with technology, become comfortable,” Crawford said. Training and education are a large part of J.C.Sweet’s business. Crawford, who trained to become an elementary school teacher, enjoys the training and teaching role. She provides internet-related training at state Small Business Development Centers, real estate companies, the Financial Planners Association, Chamber of Commerce programs for new businesses and similar venues. Stored Technology Solutions LLC announced the acquisition of Sabre Networks, which is now part of its team. Sabre is a North Carolina-based IT managed solutions company. They have a customer centric focus, and share ethics and values with StoredTech, company officials said. The company said Sabre is joining forces with StoredTech to provide better buying power; add the ability to provide deeper large enterprise solutions that can impact their clients; and to increase the level of security and stability. These additional services include telecommunications (both on premise and hosted), cloud based solutions using Microsoft Azure, security and access control, virtualization (disaster recovery), and more. Sabre Networks was founded in 1996 by Tony Hayden. Sabre has provided managed IT support services to organizations across the research triangle region of North Carolina for over 20 years. 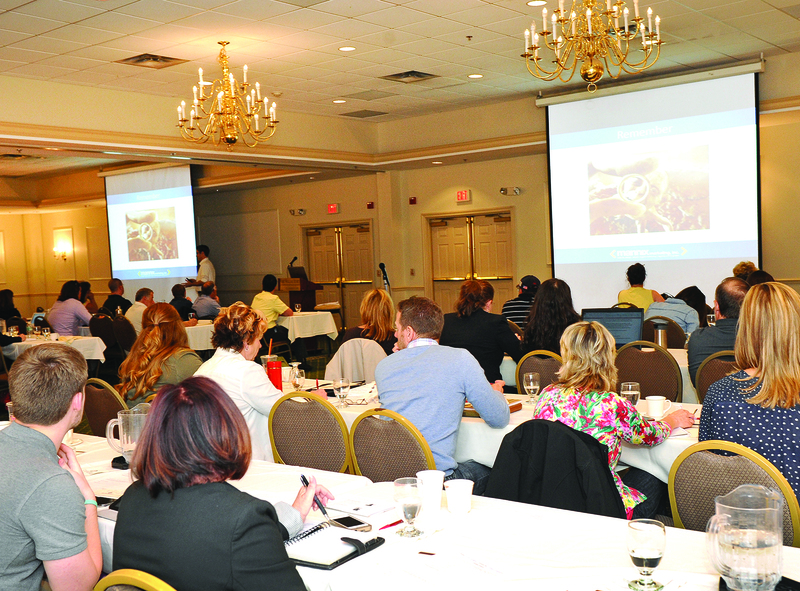 Participants listen to a presentation at last year’s M2CON conference for business owners, executives and marketing-communications professionals. This year’s conference is Oct. 19. in Lake George. Registration is open for M2Con, the one-day conference from Mannix Marketing designed for business owners, executives and marketing-communications professionals from small and medium-sized businesses. The conference will be held Wednesday, Oct. 19, from 10:30 a.m. to 5 p.m. at the Fort William Henry Hotel & Conference Center in Lake George. M2Con 2016 will feature tactical digital marketing sessions with advice attendees can immediately put into action at their companies. Megan Cornell, right, of SIX marketing says technology helps marketers serve customer needs. In a growing technological world, e-commerce for many businesses continues to rise. Much of that push is driven by convenience. Customers are able to visit their favorite store 24 hours a day, in the comfort of their own home. The process is constantly evolving. SIX aspires to make a connection with customers that is lasting and memorable. It’s never been easier to utilize technology to the advantage of your business.